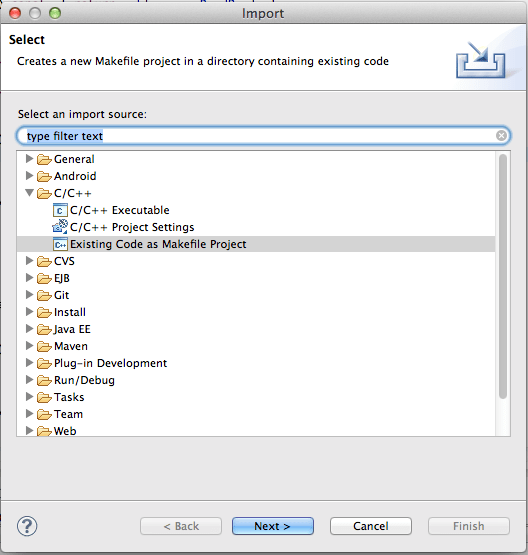 If you are a Java developer used to the productivity levels achieved by working with eclipse’s code navigation, code completion and refactoring tools, it’s worth your time staying in eclipse for any sort of C++ development. 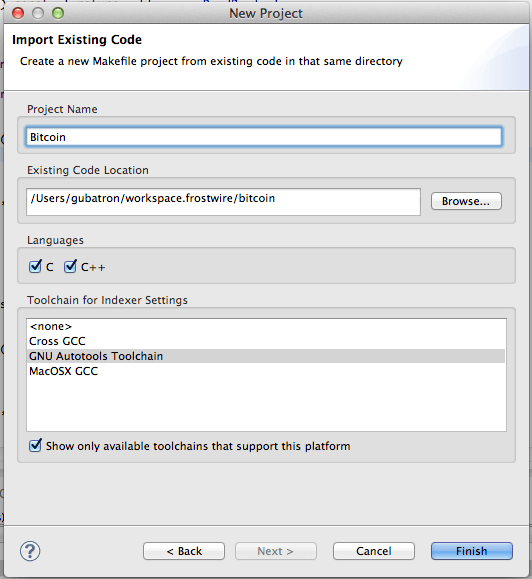 This post refers specifically to getting your eclipse environment to work with a particular C++ Open Source project, The Bitcoin Project. 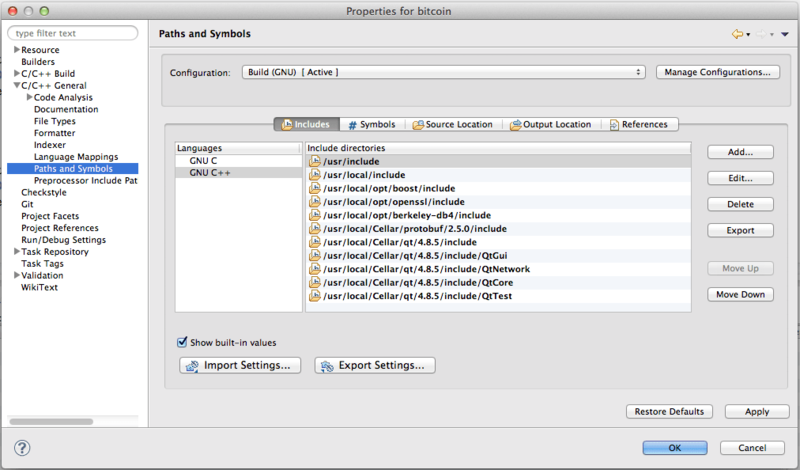 – All the dependencies (autoconf automake berkeley-db4 boost miniupnpc openssl pkg-config protobuf qt gdb) necessary to build Bitcoin which are easily installable via HomeBrew. 1. Let’s import the bitcoin/ project to our workspace. 2. Fixing the C++ compiler Path and Symbols. Right click on the project containing folder in the Project Explorer > Properties. Go to C/C++ General > Paths and Symbols > Languages: GNU C++ > “Includes” Tab and make sure it looks something like the screenshot below (I got those paths by looking at the ones used by the Makefiles in the Bitcoin. Hit Apply , OK, then wait for the reindexing, you might still have a few weird errors because of how the compiler checking settings are. 3. Remove a few more issues like “Error: Invalid arguments candidates are: void resize(?, int)." 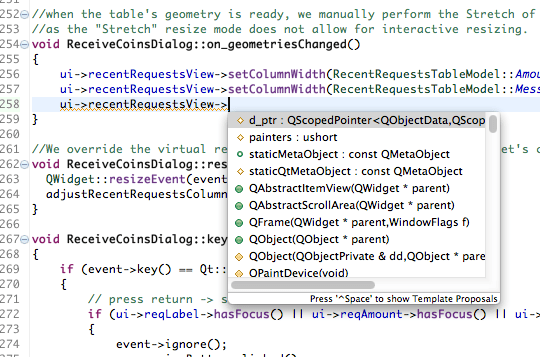 We open again the project Properties, this time we go to C/C++ General > Preproessor Include Paths, Macros, etc. 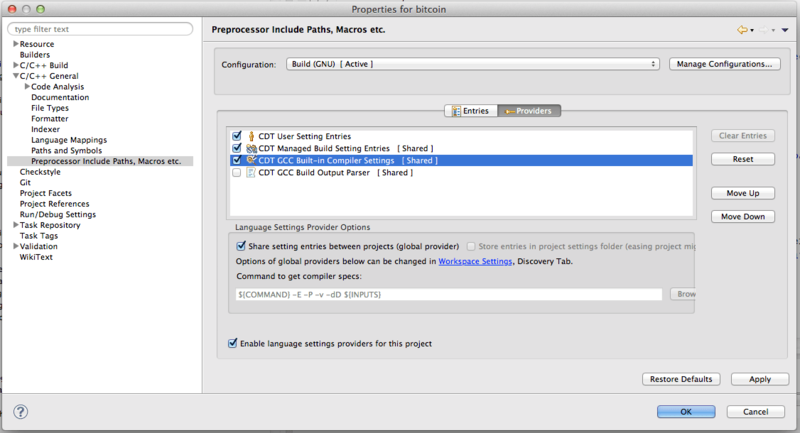 Click on the Providers tab and make sure “CDT GCC Built-in Compiler Settings [Shared]” is checked. Hit Apply, OK, wait for reindexing. If there are still errors, you might want to just delete them and refresh the project (F5 on the project folder in the Project explorer), all errors should be gone by now. 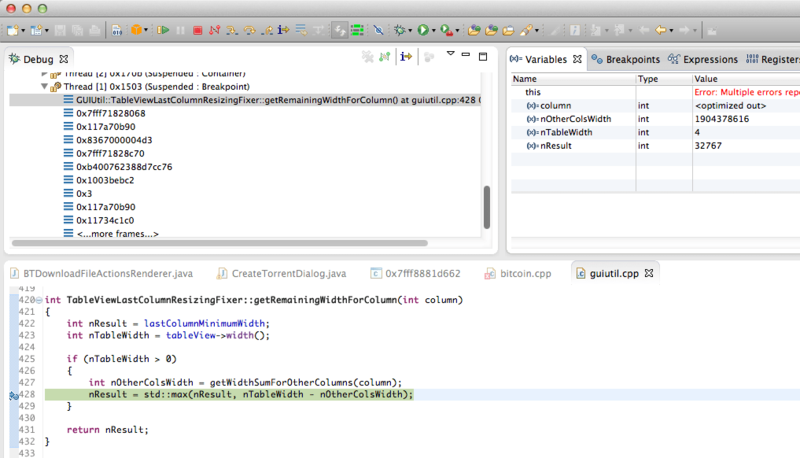 Now start working just as fast as you’re used to with Java on Eclipse. 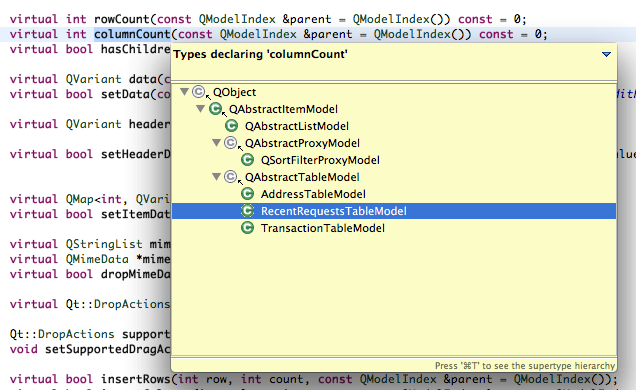 and all the tools you know and love from Eclipse. 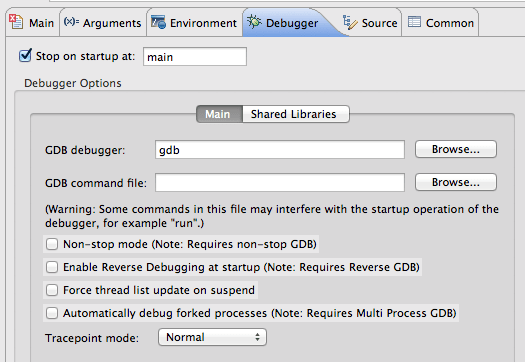 To do step by step debugging you can use gdb, if you don’t have it installed just go to your Terminal and type brew install gdb. 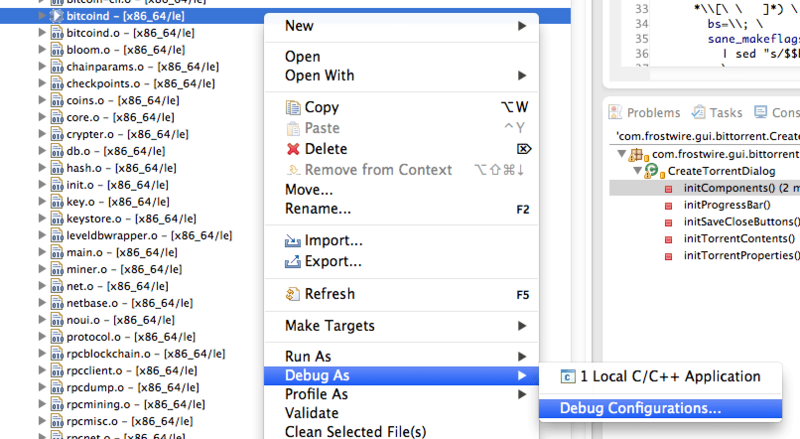 then make sure you have set gdb as the executable debugger in the “Debugger” configuration tab, then just set your breakpoints and debug away! Anyways, signing the gdb at /usr/local/bin/gdb is not that hard. To sign it you can create a certificate, or use an existing developer certificate. In my case, I already had a Mac Developer certificate so it was a very simple process, just issuing a single command in the Terminal and I finally got rid of the "Unable to find Mach task port for process-id 93213: (os/kern) failure (0x5).\n (please check gdb is codesigned - see taskgated(8))" error. Then I tried debugging, I got a password dialog to verify I was the owner of the certificate, and then gdb could take over and then I could do my step by step debugging, with the ocassional crash. Thank you, this was very helpful even though I am running Eclipse on Ubnuntu! I believe that these should be in CoreServices/CoreServices.h. Have you seen this error, and if you have, can you point me in the right direction? I may have these errors myself. 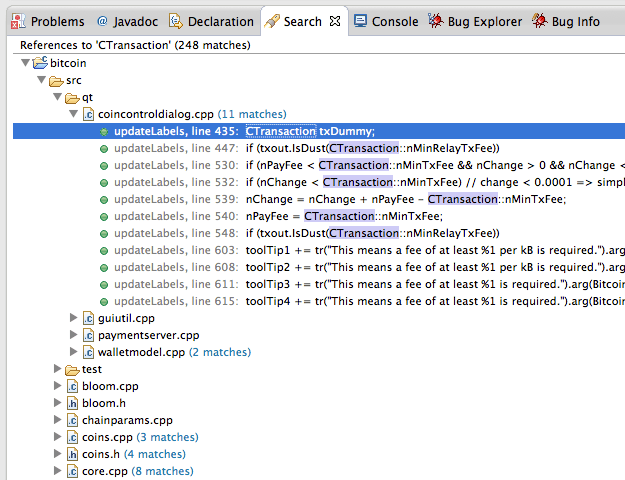 I’ve still not have the time to solve all the dependency errors, I bet there’s still a lot more to configure. In the meantime I get by using the Make scripts. I guess I was lucky that the part of the code I was fixing didn’t have any errors.